Over the last few days I downloaded a Bowie and a Pink Floyd dvdr. The Pink Floyd one is a mastertape rip, hence the cover, of a tv broadcast. While searching for something I came on the MTV.de site and read this..
Karl Hyde und Rick Smith deuteten in einem Live-Chat auf ihrer offiziellen Homepage an, dass es wohl nicht auf ihrem bisherigen Label V2 erscheinen werde, Details wollten sie aber nicht nennen. The videotape of Stormy Waters has arrived at a friends, he is going to rip it to dvd and then it's send to another friend to make menu's and graphics. Thanks to the seller and all people involved with this project! Today I recieved two records I won in auctions at the german ebay. Thanks to the seller and Matt for the info from his site. Auction has just ended for a copy of a Mother Earth/The Hump 12", one of the holy grails under Underworld collectors. It went for 157GBP... 230Euro....Fl 508 in our old currency. As I said, it is the most sought after Underworld item, only 500 were made. Notes : A nice item for any Underworld lover or collector, an original acetate cut @ soundmasters of Underworlds track - Kittens. Only a handful of these actually pressed, for the artists, select DJs and the record company. Guaranteed original acetate in excellent condition. Downloaded a torrent of Garbage - Live @ Rocknacht 03-04-2005 Koln Palladium. Great quality sound and picture. Today a pair of Underworld shoes that were signed by Karl were sold at ebay for 209GBP! 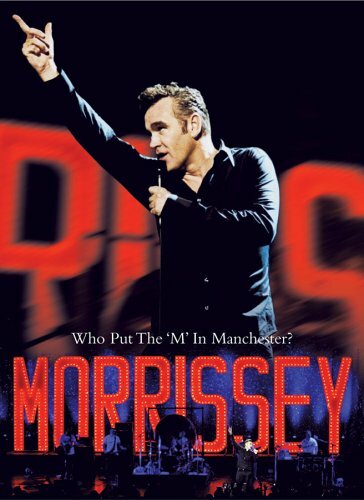 Bought Who put the 'M' in Manchester by Morrissey the other day. Very nice concert in brilliant picture and sound quality. Yesterday the boys had a lot of fun again filling the bitwaves of dirtyradio with their selection of tunes. 2 hours of Dub by Darren Price and 2 hours+ of mayham by R&K. Bought the first batch of tickets for the Underworld show at the HMH in amsterdam 17th July. Today Underworld are doing a webcast on dirtyradio again! Starting at 4pm GMT with Darren Price spinning tunes. Then at 6pm GMT Underworld will takeover the bitwaves and color dirtyradio with their selection of tunes. Today I got the Renaissance - James Zabiela~ ALiVe 2xCD with the Underworld- Dark&Long (Zabiela's Live Dub&Long Mash UP) mix on it. Also got the Renaissance The Mix Collection Sasha & John Digweed remastered 10th Anniversary Edition Triple CD with Lemon Interupt - Dirty on it. Today is a happy day again. The mailman brought me my Wasted, best of volume 1 I won a few days back at Ebay. It's a sad sad day for all people who love music. Easytree, the bootleg torrent site, is taken down. Someone threatend to take legal actions against the site. That is just silly.. the only people who still bought each cd and singles and all other releases by artist are kicked in the belly now. It was a german recordcompany that owns the rights to a recording by Nirvana that pulled the plug. So one of the most milked out bands in history did it. How utterly sad. 2 new tourdates for Underworld.